One hundred years ago, on the evening of April 23, 1918, a thousand German artillery pieces unleashed high-explosive shells and mustard gas around the French town of Villers-Bretonneux. Imperial Germany had launching a last-ditch Spring Offensive in the sector around Amiens in an attempt to defeat French and British forces before U.S. reinforcements could tilt the balance of power against them. The French village had the misfortune of being situated on a high plateau which offered a good observation point for bombardment of Amiens. British and Australian troops had repelled an initial German attack in the first week of April after a six-day battle. The morning of April 24, three shadowy shapes loomed out of the fog of dust and poisonous gases kicked up by the bombardment. Three strange rhombus-shaped behemoths made of brutally angular dark grey armor plates riveted together at the seams emerged from the murk, spitting bullets and cannon shells. This was an A7V, Germany’s first home-built tank. The keels of the 36-ton vehicles were armored in 30 millimeter of steel and resembled the ironclad warships of the U.S. Civil War. A stubby 57-millimeter cannon protruded from the monster’s prow, while three MG08 Maxim machine guns poked from each side of its seven-meter-long hull. The top-heavy vehicles were prone to tipping over, and could manage nine miles per hour on roads, or half that cross-country. The lead A7V was named Nixe (“Mermaid”) and she was commanded by 41-year-old 2nd Lt. Wilhelm Biltz, an accomplished chemistry professor in civilian life. Biltz had to manage a standard crew of 18 inside the cramped vehicle. Rolling ahead alongside attacking infantry, Biltz’s vehicle destroyed several Australian machine gun nests and overran infantry entrenchments. Altogether 13 A7Vs in various sectors were deployed to various sectors in support of four German infantry divisions leading the morning assault. They overran a five-mile wide gap held by the Australian 8th Division and seized Villers-Brettoneux. The Australian troops were not used to being attacked by tanks—usually it was the Germans who were on the receiving ends of armored assaults during World War I. 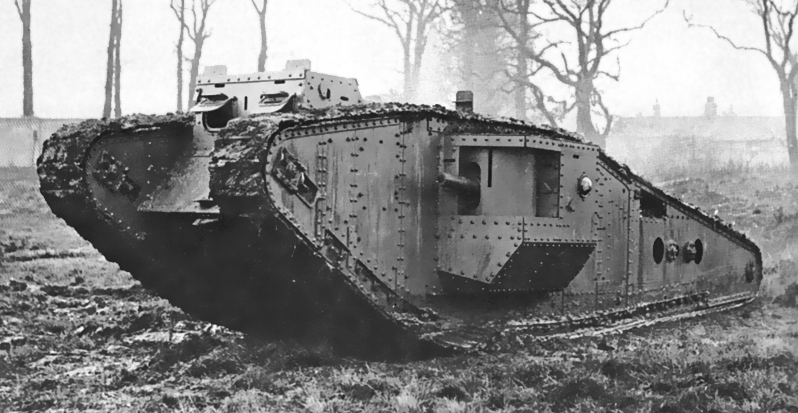 The British Army deployed its first tank, the Mark I to mixed effect in the Battle of Somme in 1916. Though initially terrifying to German infantry, the Mark I proved vulnerable to artillery. However, most of cumbersome vehicles were lost when they broke down or become immobilized on difficult terrain and were abandoned by their crews. However, a year later the British concentrated over four hundred improved Mark IV tanks to rupture German defensive lines in the Battle of Cambrai. Although British inability to rapidly exploit that breakthrough gave the Germans time to retake Cambrai using newly developed “storm trooper” infiltration tactics, the tank had finally proven its potential to be a decisive weapon. The initially skeptical German Army began forming its own tank corps using abandoned British and French tanks. Finally, in 1918 they finished building 20 better-armored A7Vs which were assigned to Sturmpanzer Abteilung (battalions) I, II and III. However, the small German tank fleet had yet to encounter Allied tanks in battle. The British tankers of the A Company of the Tank Corps were having an awful morning. They had been assigned to guard the railway switchline at the hamlet of Cachy, southwest of Villers-Bretonneux. Caught outside their vehicles during the German bombardment, the crew of Lt. Frank Mitchell’s Mark IV tanks were badly exposed. Mustard gas painfully blisters and scars the skin on contact—and the inside of the lungs if inhaled. Out of Mitchell’s crew of seven, only three were left any condition to operate their vehicle. Nonetheless, all three Mark IV tanks of No. 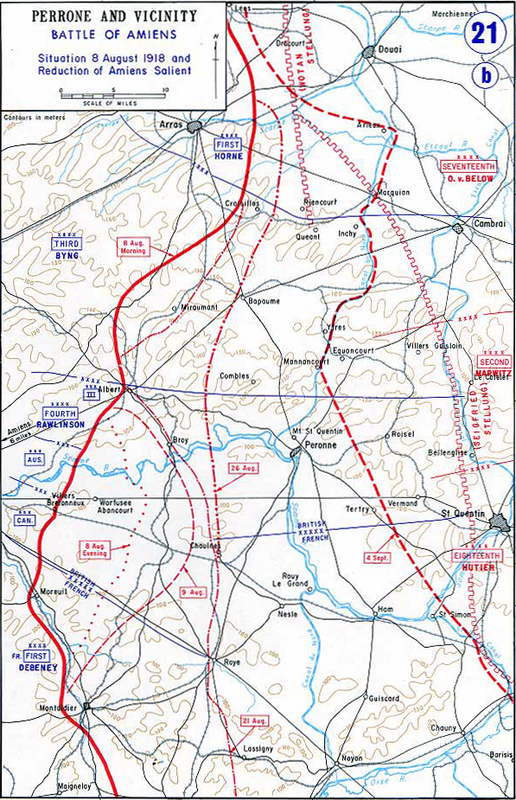 1 Section — equivalent to a platoon — sallied forth to counter the German troops advancing on Cachy. The 29-ton Mark IV tank resembled a boxy parallelogram sheathed in 12 to 17-millimeter of steel armor. Huge tracks as tall as the hull propelled it a maximum speed of four miles per hour. Mitchell’s tank was a Mark IV “male” tank, a phallic reference to the fact it was armed with two side-mounted six-pounder Ordnance Quick Fire cannons on swiveling sponsons with 100 degree arcs of fire. Like the German tank guns, these also fired 57-millimeter shells. Additionally, there was a front-mounted Hotchkiss .303 machine guns, as well as one in each side sponson. The two tanks accompanying Mitchelle were Mark IV “females,” armed only with five machine guns to protect the male tanks from being swarmed by enemy infantry. These early tanks were claustrophobic nightmares for their crews. Poorly ventilated, choking gunpowder fumes rapidly accumulated in the crew compartment, which were unbearably hot. Worse, the crew had to breath through suffocating gas masks in case of chemical weapons attacks. The noise produced by the six-cylinder inline petrol engine was deafening, so a system of colored lights had to be employed to transmit simple commands driving and targeting commands to the crew of seven. As Mitchell’s section lumbered forth, he spotted the Nixe 300 meters away. Tanks had never fought each other in battle before, but like eager but inexperienced young lovers, the opposing armored forces made up with enthusiasm and experimentation what they lacked in expertise. The Mark IV females raked Nixe with their machine guns—but even primitive tanks could not be penetrated by rifle-caliber machine-gun fire. The Nixe’s cannon in turn blasted holes in the females, crippling one and exposing them to small arms fire, forcing both to withdraw. Meanwhile, Mitchell’s tank charged towards the Nixe, his cannon wildly flinging high explosive rounds. Neither side had armor-piercing shells. However, his six-pounder guns kept on missing as the unwieldy Mark IV lurched to and fro on the terrain. Meanwhile, machine-gun fire from Nixe caused the Mark IV’s thinner armor to spall into sharp fragments, badly injuring the driver in the legs. Finally, Mitchell realized he would only be able to deliver accurate fire if he remained immobile. He halted the vehicle, and his gunner slammed three shells into the Nixe until it turned on its side. Stuck in place as British shells rained down, Biltz decided it was time to abandons ship—though eight of his crew were gunned down as they fled their vehicle. As Biltz’s two A7V squadron mates clattered into view, Mitchelle’s lone Mark IV began potting cannon shells at them as well. Despite outnumbering the lone British tank, both vehicles retreated rather than risk Biltz’s fate. The armored action was not yet finished. Mitchell’s lone tank began blasting canister shells — shotgun shell-like munitions packed full of steel balls — at attacking German infantry. Soon he was joined by a squadron of seven 14-ton Mark A “Whippet” medium tanks. These three-man tanks were twice as fast as a Mark IV at eight miles per hour, and were armed with four Hotchkiss machine guns, one for each facing of the vehicle. The Whippets plowed straight into German infantry battalions forming up to advance, machine guns chattering. Three were knocked out by artillery, killing five crew, but the remainder wreaked such havoc that they returned to enemy lines with blood splattered all over their tracks, according to Mitchell. Mitchell’s tank, meanwhile, became a target first for a strafing German fighter plane, and then from an indirect fire from a field gun. Mitchell unsuccessfully tried evading the shellfire, but eventually shrapnel from a round jammed its tracks. Mitchell and his crew escaped to a nearby trench. Meanwhile, Lt. Biltz, seeing that the coast was clear, crept back up to the abandoned Nixe with the survivors of his crew. They somehow managed to restore 32-ton vehicle to running order and crawled it back to friendly lines. 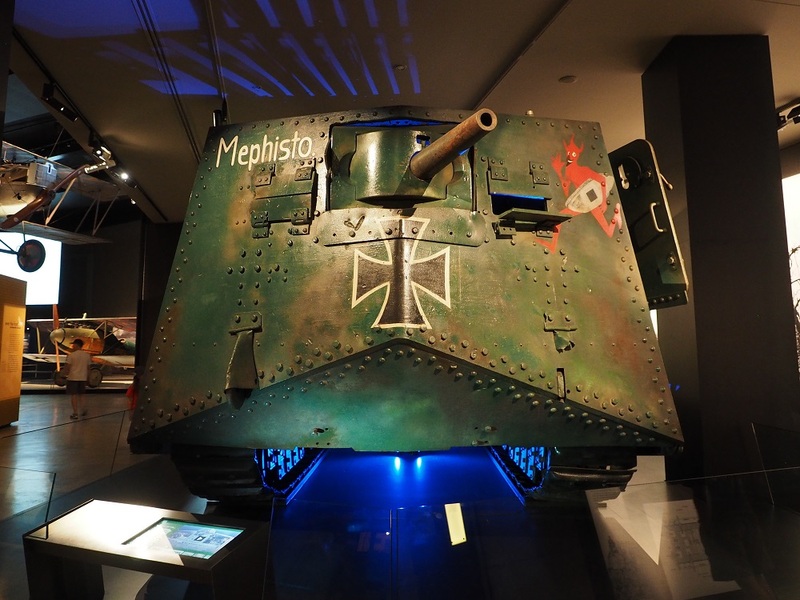 Another A7V, Mephisto, was abandoned on the battlefield and captured by Australian troops while still in combat. Today it can be seen at the Queensland Museum in Brisbane, Australia, decorated with a red devil carrying what appears to be a surfboard under one arm but is in fact meant to represent a tank. Starting around noon, a series of rapid counter attacks by British, Australian, French and Moroccan troops rolled German forces back out, culminating in a night assault that surrounded and eventually recaptured Villers-Brettoneux. The skirmish between Mitchell and Biltz was but a foretaste of the armored warfare which would devastate much of Europe two decades later. Still it outlined simple but useful lessons to military observers wise enough to pay attention, such as the impotence of machine-gun armed tanks versus cannon-armed vehicles and the importance of coming to halt to deliver accurate cannon fire. Those lessons might seem obvious in hindsight, but England, Germany and Poland all continued deploying numerous machinegun-only tanks at the beginning of World War II before their tactical inadequacy finally sank in. For the British and German crew and junior officers on the morning of April 24, they had to improvise every step of how they engaged in their first battle between lumbering armored behemoths.